"I came here as a clean slate and was taught very well by talented faculty." Taken in its entirety, a schedule of upcoming concerts featuring the music of Morten Lauridsen reads like a career retrospective. The L.A. Master Chorale, Pasadena Symphony and the American Choral Directors Association’s Western Division all have decided that Spring 2014 is the season to celebrate USC Distinguished Professor Morten Lauridsen and his music. Several concerts and screenings of the 2012 documentary about the famed choral composer are scheduled from mid-February through the end of March. “It is serendipity of the most wonderful kind,” Lauridsen said of the various events. In 2007, Lauridsen won the National Medal of Arts for his remarkable career as a choral composer. A professor of composition at USC Thornton for more than 40 years, Lauridsen’s music has been featured on more than 200 albums — five of which have received GRAMMY nominations — and is performed widely around the globe. On Saturday, Feb. 15, the Pasadena Symphony will celebrate the 30th anniversary of Mid-Winter Songs, the first of Lauridsen’s five choral cycles originally commissioned to celebrate USC’s Centennial in 1981. 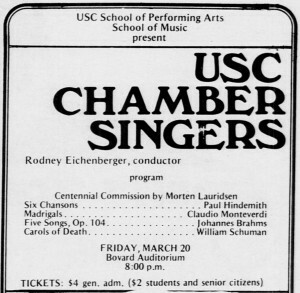 A Daily Trojan advertisement for the 1981 USC Chamber Singers centennial concert. Robert Duerr, founder of the Pasadena Chamber Orchestra and a former student of Lauridsen’s, attended the Mid-Winter Songs premiere, and went on to commission an orchestral version of the same piece. The Pasadena Symphony will perform that work in the same hall, Ambassador Auditorium, where it premiered 30 years ago. The Los Angeles Master Chorale performed the same piece two years later at the Los Angeles Music Center. From 1994 until 2001, Lauridsen served as composer-in-residence for the chorale, writing some of his most famous works, including landmark pieces O Magnum Mysterium and Lux Aeterna. The works have been celebrated the world over and are integral to choral literature. On Saturday, Feb. 22, the chorale will perform Lauridsen works at the Western Division American Choral Directors Association Conference in Santa Barbara, where Lauridsen is being honored. 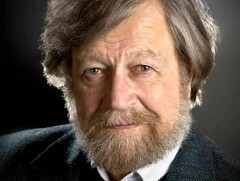 The event will feature a screening of the 2012 documentary Shining Night: A Portrait of Composer Morten Lauridsen. The USC Thornton Chamber Singers, led by conductor Jo-Michael Scheibe, will perform the day before as one of the featured performances of the conference. In mid-March, the Master Chorale has scheduled two events to celebrate Lauridsen. On March 14, the Alex Theatre in Glendale will host a screening of Shining Night. Lauridsen, the documentary’s director Michael Stillwater and chorale music director Grant Gershon will be present for a post-screening conversation. Then on March 16, the Master Chorale will perform a concert at Walt Disney Concert Hall that features many of the works the composer wrote for the ensemble. Like the Pasadena Symphony’s celebration, the March 16 Master Chorale concert has roots in Mid-Winter Songs’ premiere. Master Chorale music director Gershon, a Thornton alumnus who will conduct the performance at Disney Hall, was a USC student at the time of the Centennial. He sang in the chorus for the premiere performance of Mid-Winter Songs in Bovard Auditorium. Lauridsen, an alumnus with three USC Thornton degrees, credits the music school for his success. Lauridsen’s USC roots remain deep. His most recent collaboration is a setting of the poem Prayer by Dana Gioia, USC’s Judge Widney Professor of Poetry and Public Culture. The final spring Lauridsen tribute concerts will be March 29 and 30 by the Santa Barbara Choral Society and Orchestra at the Lobero Theatre in that city. One final honor the composer has received this spring is a new title on his resume: the Honorary Artistic President of INTERKULTUR and the World Choir Games. As part of this new position, he will travel to the biannual international choir festival in Latvia in July. Saturday, Feb. 15, 2 p.m. and 8 p.m.
Friday, March 14, 8 p.m.
A screening of Shining Night and post-show conversation with film director Michael Stillwater, chorale music director Grant Gershon and Morten Lauridsen. Sunday, March 16, 7 p.m.
Sunday, March 30, 2 p.m.